Sunny day in Zurich and already dreaming about spring and summer days to come! Really want to add a bright pop of colour to my bag collection and thought one of these envelope style crossbody bags would be a nice addition. Torn between these two, what do you think? I adore the blue one!!! If I could I would get both. I love MK but to be honest the navy bag has more character. Good luck in making decision. It’s not easy. Take both !! They are gorgeous ! Thank for you message on IFB , Steph , I just became your newest follower on GFC ! Go for the Hulme bag. It’s more vibrant and bold, and well, MK is overrated anyway, ha ha. P.S. Would you like to follow each other on bloglovin? Oh I would choose MK if the decision was left to Me 🙂 Thanks for stoping by my blog. Now following you, hope you do the same. To chos MK is more pretty and cute to me. Btw sweetie now i´m following you I hope your follow me back. I like both of them. A litle more the blue bag. Thanks for visit my blog. I´m following you now. love this bags and also your blog! It’s so nice!!! I follow you! Great post and blog. Lets follow each other? Michael Kors!! Great transitional colour into spring/summer ! 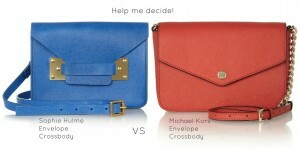 I like them both but I would go for the Michael Kors! I loved the Michael Kors. Its so chic and has a versatile look. I love the red MK one! I’m such a sucker for Sophie Hulme bags!! Love the color and the details!! Definitely MK, it’s perfect for spring, the look and color! Kisses! Have a nice day! Molto carina quella di M.K. (: Reb, xoxo.